Every album Buddy Guy has released for Silvertone records (beginning with Damn Right I've Got the Blues) has had some sort of angle, shtick, or concept. Guy has managed to record some memorable music despite these contrivances but this approach begs the question: What might Guy's albums sound like if people quit trying to reinvent him and if he quit allowing them to do it? What is the concept behind this album? You might call it Supernatural II. Hell, they even invited Carlos Santana but that is the lone similarity between Bring 'Em In and Santana's Grammy-winning blockbuster. Clive Davis and Santana recruited hip names with pop credentials. Guy's guest list has some of that, but Bring 'Em In can't quite make up its mind if that's the path it wants to follow or not. The best tracks on this album are more often than not the songs without any guests. Unfortunately that only leaves half the album. It is not that the guests on the album are no good. It is not even just that Buddy Guy is an amazing artist and a blues icon (and finally a member of the Rock and Roll Hall of Fame that can more than hold a listener's attention (he can). It is that many of the artists paired with Guy seem lost when trying to meld their talents with his. This is never more obvious than when Guy has the entire song to himself. The first four songs on Bring 'em In are probably the highpoints the rest of the disc chases. The one exception to the guest star problem is Keith Richards. Richards, as a rhythm player, melts into the background on "The Price You Gotta Pay" and is neither essential nor distracting in his cameo. "The Price You Gotta Pay" is actually one of the standout tracks on the disc. 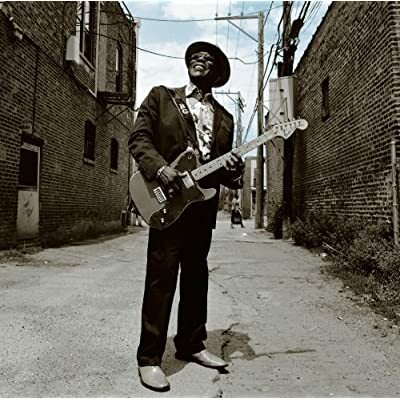 It was written by contemporary bluesman Keb' Mo' (who cameos on guitar on "Ain't No Sunshine"). The song details a man's struggles with fidelity. Plenty of songs have been written on the subject but all too often they are boorish or unapologetic. The lyrics to "The Price You Gotta Pay" are far more regret filled and Guy's age and experience make this look back feel all the more authentic. Guy's vocal performance on "Now You're Gone," "Ain't No Sunshine," and "What Kind of Woman is This" make his previous effort, Blues Singer, sound every bit as lazy as some critics said it was upon its release. Guy's falsetto packs much more wallop in these songs than it did at any point on that previous outing. His vocals throughout the album really are terrific and diverse, characteristic frenzy occasionally giving way to eased, relaxed quips. Steve Jordan handles the producer's duty as well as the drumming on the album. Jordan worked on Keith Richards' solo records and has worked with Springsteen and many, many other big names. His credentials as a rock producer are impressive, varied, and undeniable but that doesn't entirely translate here. The sound is not unbearably slick but there are times it comes close. They did not have ProTools when Guy recorded A Man and the Blues or when Guy sat second chair on Muddy Waters' Folk Singer album. Technology that allows us to hear Buddy play and sing is a good thing. Technology that removes the blood and guts that epitomize blues (and Buddy Guy) is not. The slickness and polish can sometimes make Guy sound older than he is. If there was a chance anything on Bring 'em In could cross over as a hit single the slickness might be easier to forgive. There is no chance of that here (which is not an indictment of the record as much as it is the state of radio) so glossing over the rough edges hurts the record without improving its chances for commercial success. Robert Randolph and Carlos Santana are both incredible guitarists. So is Buddy Guy. We don't need either of them on this album because Guy can still raise the hair on your neck with one note. This was also a problem on Damn Right I've Got the Blues. Eric Clapton, Jeff Beck, and Mark Knopfler have achieved legendary status and are first-rate guitarists but none are better than the man with whom they are collaborating. "I Put a Spell on You" (the Santana collaboration) is far from terrible and Randolph's work is not the reason "Lay Lady Lay" does not work but neither track is particularly memorable. John Mayer sounds completely out of place on "I've Got Dreams to Remember." The 50 years separating Guy and Mayer are never more obvious than when Mayer takes the microphone- he sounds like he is 12-years old. Mayer's vocals usually have an air of earnestness to them. His vocal on "I've Got Dreams to Remember" is bland and is made blander by the more emotive Guy. Tracy Chapman loans her voice to "Ain't No Sunshine." There is no vocal interaction between Chapman and Guy until the last 40 seconds of the song. Chapman is a capable vocalist who sounds more at home on the song than one might expect but that is because the arrangement is more Adult Contemporary than blues. Anthony Hamilton and the background singers get too much time on center stage during "Lay, Lady Lay." Maybe that explains Guy's speak-singing of the bridge. Either way, Guy sounds like the guest star on this track rather than the other way around. There are more than enough great moments to make this enjoyable. Bring 'em In should be celebrated because very few legends are still compelling in their later years. The spirit, the passion, and the prowess that is Buddy Guy still rise above the occasional contrivance and the passage of time. Bring 'em In might not move the legend forward but it does not set him back, either. There are scores of veteran performers who wish their later records could say the same.